Things change, and I recently got caught out by one of those changes. In PeopleTools 8.4x, the Process Scheduler became a proper Tuxedo domain. By default, it is configured to run Application Engine server processes (PSAESRV). These are persistent Tuxedo server processes that handle Application Engine requests. This change was introduced to help CRM systems that typically run a very large number of Application Engine programs. Because the server process is persistent it saves the overhead of starting a new Application Engine process. An obvious side effect of this change in architecture is that if you shut the Process Scheduler down, it terminates the PSAESRV processes, and cancels any Application Engine program that is running. You can choose to configure the Process Scheduler without PSAESRV processes, and it will start individual PSAE processes for each Application Engine request. 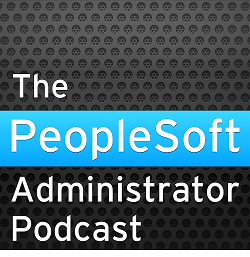 In previous versions of PeopleTools, it was possible to shut the Process Scheduler down and any running processes (except PSAESRVs) would continue to run. This is not the case in PeopleTools 8.48. On shutdown, the Process Scheduler attempts to cancel the PSAE process. If it is not successful the status of the process goes to Error, but the process continues to run. PSPRCSRV.1360 (0) [...](3)    Updating process instance's status to Error. But when it starts up again it cannot detect the PID of the process, and so it marks the status as 3 (Error). I'm not sure exactly when this change was introduced, but this is the first time I have encountered it. According to peoplesoft, dynamic sampling should be disabled(solution ID# 201049233) which I don't agree. The analyst I talked to, says that the recommendation came from their performance and benchmarking team. Any peoplesoft customers out there who have specifically disabled the default behaviour of Oracle10G? It was extremely interesting for me to read that article. Thanx for it. I like such topics and anything that is connected to this matter. I would like to read more on that blog soon.